I have a rediscovered Zoya favorite to share with you today. This comes at perfect timing too, because the Zoya Earth Day Exchange promo is going on. I think this will be one you might want to add your shopping cart! 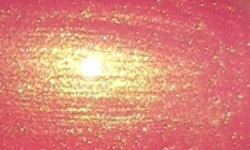 Happi is a warm carnation pink with a beautiful peachy-gold duochrome metallic shimmer. Color: One thing I find I miss most in nail polish lately are original pinks. Zoya Happi is a very original pink shade. First, it's not your standard spring pastel pink, this light-medium warm pink. Secondly, that duochrome metallic shimmer. That golden shimmer is stunning and adds so much dimension to this polish. Formula: The formula on this is nice an easy to use. I used 3 thin coats above. Price: This is $9 on the Zoya website. If you do purchase this during the Earth Day promo be sure to add 5 or more other polishes to your cart and use the code EARTHLUV. You'll get your order for 50% off plus free shipping! Overall: I am absolutely ashamed this was collecting dust in my Helmer for so long. This is one of Zoya's most beautiful creations in my opinion. I love this original and beautifully done take on spring pink shade. I think this is an absolute must have in any nail polish collection! The gold shimmer in this pink is lovely. I agree, I also have it and it is a beauty. And I believe I got it during last years Earth Day sale. I have this in my untrieds too! I'm glad to see your swatches of it, as it's prettier than I thought it would be.